When my five year plan works out and I’m doing the backstroke through piles of cash (a la Scrooge McDuck), I have every intention of owning a giant warehouse of some sort for all of my decorating joys. Categorized by season, style or room (I’ll have my man-servant help me decide), I’ll stroll down the aisles selecting cobalt china, hobnail milk glass vases, copper clocks or leopard print pillows while sipping champagne out of a Louboutin (just because I can). Meanwhile, however, my apartment requires a slightly smaller inventory of options. Versatility and multi-tasking have simply become a requirement for any piece in my décor reserve. To that end, below are my top three pieces that every decorating arsenal should have. 1. A Large Glass Vase. (For the most versatility, I recommend square or cylindrical. If you have a little bit more room to store, you might look into something with more detail – perhaps a pedestal, or trumpet style). Glass vases are the work horse of design – capable of adding a huge impact to a space, without being relegated to one style. In addition to housing flowers, they can be filled with ornaments for Christmas, seashells in the summer, or pine cones and acorns in the fall. 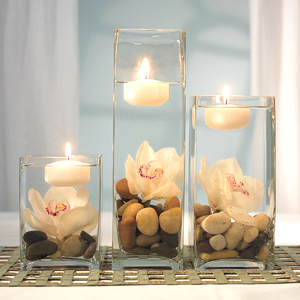 Vases with wide mouths can act as hurricanes for beautiful candles. Set in a bathroom, they serve a double duty - housing soaps, brushes or accessories while adding some personality. 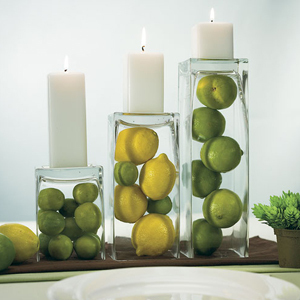 Turn the vase upside down and use it as a cloche, or an unobtrusive riser for adding height to a display. Change the look of your vase completely by wrapping it with ribbon, craft paper, burlap, rope, or inserting photos or paper die cuts. 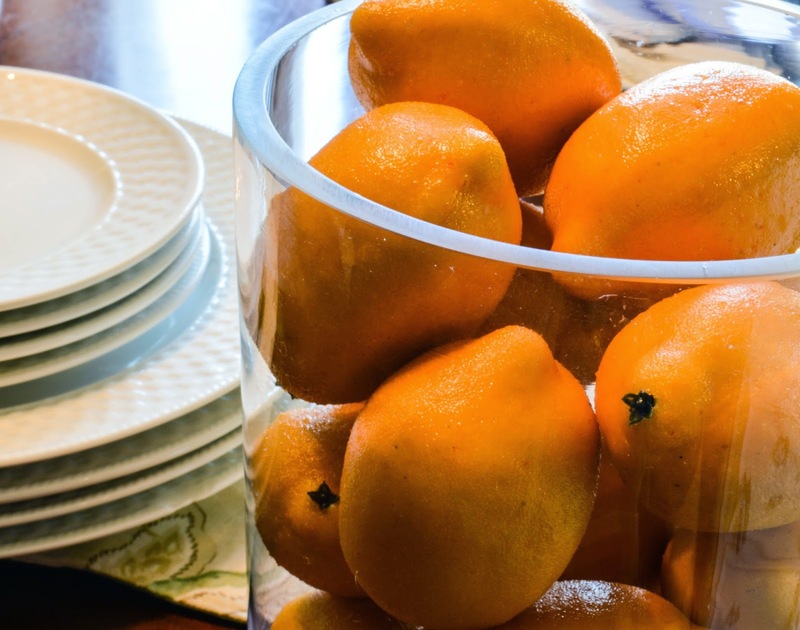 Storage: When it comes to storage, smaller objects can be wrapped and stored within the vase, or the vase itself can be wrapped and stored within another narrow object. Remember – the goal here is to conserve space! Books are my favorite design element. It’s not just from my love of stories, but also the fact that each one seems to brim with personality. That personality can be translated to any display or room. 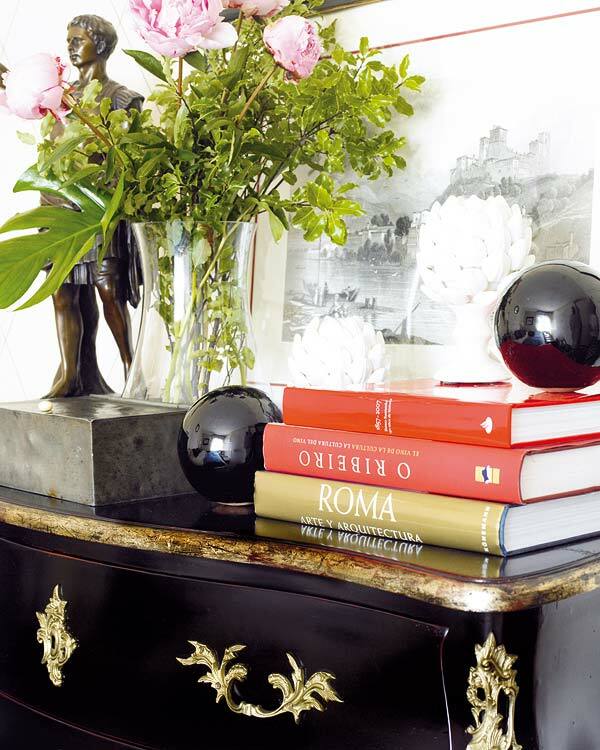 On mantels, tables or shelves, stack books to add levels, section off space, or provide a backdrop for smaller pieces. Tie several together with pretty ribbon to create a single design element. Display books according to the season or mood you want to emphasize, either by the theme of the book, or the color. 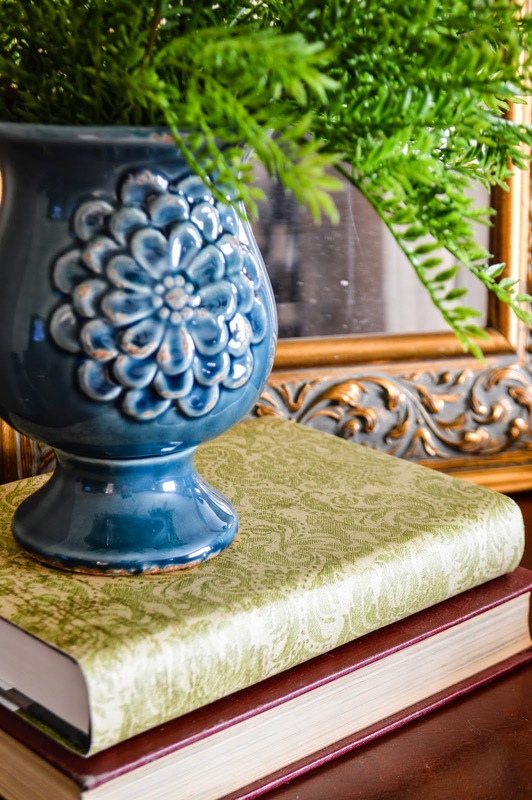 If you don’t have the colors you’d like or the covers of the books you love leave something to be desired, use coordinating papers (craft or even wrapping) to recover books and completely change their appearance. Turn some backwards to hide spines you don’t like, and to add an eclectic feeling. 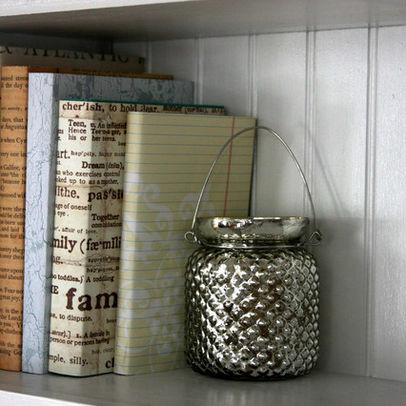 Combine groupings of vertical and horizontal books and create niches for pictures, candles, plants or other art. With the presence of the internet, encyclopedia sets have taken up residence in attics, basements, and thrift shops. Many are quite beautiful however (and fun to read on rainy afternoons! ), and you can weave volumes in various locations around the room for a continued color theme. A large number of hardbacks can even be piled up and used as a completely unique end table. Storage: When your books are no longer being featured in a display, they can be quarantined back on shelves, in drawers, or stacked under other stored objects in cabinets. Make sure to keep them in dry, dark places to prevent damage. 3. A good quality frame with an opening for 8x10 pictures. (Once you have more money and/or space available to you, get several of the same frames for increased impact). Nothing changes the look of a room like artwork. Why an 8 x 10? Because that's the biggest common pic size that you can print out from your computer. Did I just recommend a little bit of art thievery? Well, sort of. It may not be quite to the moral justification level of stealing a loaf of bread, but I do believe that art should not be a luxury only for the wealthy. That said, if it's the work of an artist or photographer, do your best to SUPPORT them and actually purchase their images, particularly if they're not established. Change your personal photos with the seasons, and feature new ones occasionally that match your current decor theme. You don't have to be a stellar photographer - basic online programs can turn your pics from color to black and white (which, for whatever reason, always seems to up the artistic value). Use a web search to locate images that add to the ambiance you're looking to create: perhaps a close up of an ornament, a funky item that makes you nostalgic (wooden sleds, typewriters, glass coke bottles, penny farthing bicycles), or a famous art piece that speaks to you (ala Chat Noir, or Saturday Evening Post covers). Frame art of a different nature. Find beautiful post cards, or greeting cards, pieces of patterned fabric that you find beautiful, pages from books, printed definitions or favorite quotes. Remove the glass all together, cover the backing with adhesive cork (available at any craft store) and use pretty tacks to hang necklaces, earrings and pins. Think Inside The Frame (ha Ha! Take THAT open-minded, cliche-slinging individuals!). Showcase your art with creative matting. Carefully cut craft paper, cloth, wrapping paper or newsprint, add to card stock and replace your store bought matte. Check out Etsy for beautiful, unique and inexpensive artwork, and support young artists. Remember: your home should be a reflection of your personality. It doesn’t matter what books, magazines, celebrities, designers, TV or *ahem* bloggers deem “in”. If it doesn’t, in some way, reflect who you are and what you love, then it’s not worth emulating.